The digital age has brought with it new and powerful computer-based methods of analyzing heretofore elusive patterns of nonverbal behavior. C-BAS (Meservy 2010) is a computer-assisted behavioral observation tool for identifying and tracking nonverbal behaviors from video. THEME (Magnusson, The hidden structure of interaction: from neurons to culture patterns, IOS Press, Amsterdam, pp 4–22, 2005) is a software program that discovers patterns among discrete events in time-ordered data. Together, these tools enable more precise measurement and analysis of nonverbal behavioral dynamics. 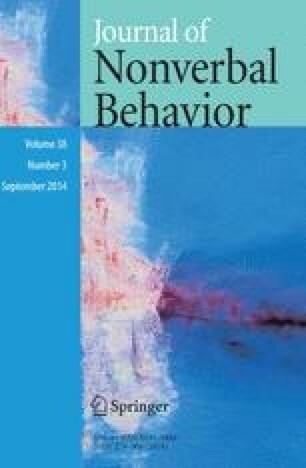 Applications to three corpora derived from interpersonal deception experiments reveal unique nonverbal patterns that distinguish deceptive from nondeceptive interactions. The first and second experiments produced serial, hierarchically related patterns of behaviors that differed in length and complexity between truthful and deceptive participants during interviews about a theft and cheating, respectively. The third experiment produced differential patterns by and among group members completing a task. Deceivers were inclined toward strategic initiations and interactional control, whereas suspicious group members adopted a more passive, possibly watchful stance. Discovery of these patterns challenges the prevailing view that nonverbal behaviors are too faint and inconsistent to identify deceptive communication. Results have numerous implications regarding the following: the development of new measurement tools locating significant effects of nonverbal behaviors, support for theory that coherent and repetitive relationships exist within and among interactants’ communication, demonstration of the role of nonverbal behaviors in deceptive communication and the dynamic and strategic nature of deception. The authors gratefully acknowledge the considerable advice and consultation by Dr. Magnus Magnusson, University of Iceland, who developed THEME and expanded its features for the benefit of this research project. Portions of this research were supported by funding from the U. S. Air Force Office of Scientific Research under the U. S. Department of Defense University Research Initiative (Grant #F49620-01-1-0394; PI: Burgoon) and the National Science Foundation (Grant # 0725895, Award IIP-1068026; PI: Burgoon). The views, opinions, and/or findings in this report are those of the authors and should not be construed as an official Department of Defense or National Science Foundation position, policy, or decision.